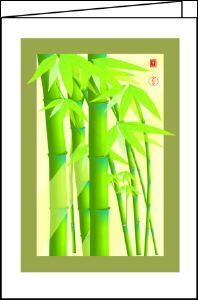 As well as beauty, Bamboo has many useful and practical qualities. Not least of these are strength, lightness and flexibility; some of these qualities aspired to by all Tai Chi players. There are 8 designs available in this style. These cards are blank inside for your own message. They are approx. 10.5cm x 15cm and come with an envelope.